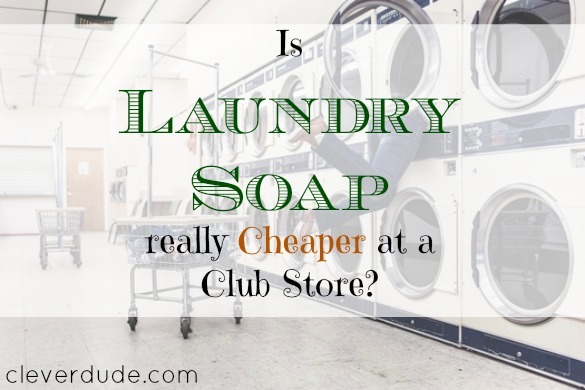 Cost Comparison: Is Laundry Soap Really Cheaper at a Club Store? Back in April when I renewed my executive Costco membership, I vowed that I would start buying as many household items there as I could in order to take advantage of the 2% cashback perk. However, it would be foolish to just buy items at Costco for that reason only. If the cost was 10% higher, I really wouldn’t be gaining anything. One thing that I can easily buy at Costco vs where I grocery shop now (Walmart) is laundry detergent. 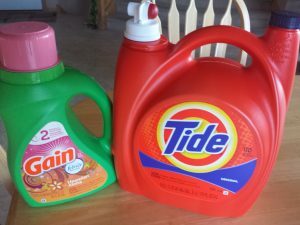 Is laundry detergent cheaper at Costco vs. Walmart? $5.10 / 50oz = 10.2 cents per ounce. However, comparing cost per ounce is a mistake. This is exactly the kind of product I want to switch from buying at Walmart, to buying at Costco to take advantage of not only lower prices, but also my 2% cash back. Club stores rely in part on the perception that buying bigger is always cheaper. That’s not always the case, but in this case it certainly is. It can be a bit of a challenge to shop at Costco without paying for a membership, however there ways around it. Jeffrey over at savingadvice.com has a pretty good write up of how to shop at Costco without a membership. Have you ever done cost comparisons for products at club stores? Have you ever found a product that is MORE expensive at a club store? Thank you for explaining both cost-per-ounce and cost-per-wash. My wife has issues with why the latter is important in soaps even though she makes her own (body/hand only). I was picking up supplies for ‘nacho night’ and noticed sour cream in the big container was $0.02/oz more expensive. Not anything to sweat, but it made me realize that even standard grocery stores might slip one by since we’re trained that ‘more is cheaper’. To make your deal even sweeter, the detergent companies always tell you that you need more soap than you really do, so you can lessen the amount that you use, making cost per load even less. I find with Tide, 2/3 of the recommended amount works great. Sometimes other reasons come into play, as in our case. We use Costco and though I know we could probably do better, there’s a couple of reasons we don’t shop this around. My wife does not like fragrance in clothes. I have sensitive skin and never know what different things will do, where I know that the Costco stuff we get seems to be OK. We also understand that in order to get the best deal you have to be flexible and not be tied to a brand. But, we know that the Costco brand works and are not willing to chance finding a lesser performing brand. All that together and we’re fine with the Costco brand, even though I realize we at times probably pay more than the best available deal. I agree with Cathie. You should try decreasing the amount of detergent you use. I use less than half the recommended amount (small washer though) and my clothes get just as clean. I do use a little more for loads of my boyfriend’s really dirty work clothes. Just try decreasing the amount you use by maybe a fifth or a quarter, then keep decreasing until you notice your clothes aren’t as clean, then go back up just a bit. If you can use half the detergent per load, then it’s like paying half price on it for all that you buy in the future. If you can decrease by 1/3 like Cathie, then you’re saving 33%. @Dan – Paying attention to the cost per serving is always a good idea. I’ve love to know the reasoning behind pricing a larger container at a more expensive cost! @poor student – it depends upon the product – you have to determine what “unit” makes sense for the product you’re comparing. Laundry soap is price per load, toilet paper you have to take into consideration not only the “length” of the roll but also the thickness. Good luck! @Cathie – good point, and I’m glad you brought that up. I read once that the amount of detergent the manufacturers recommend is based on outdated information about washing machines and the strength of the product. I use 1/2 as much soap for most loads, but 3/4ths if the items are soiled. thanks for sharing! @MoneyBeagle – Personal preference, OR a personal need certainly weighs into the equation too. Sometimes certain types of products just don’t work – we found this with Old Navy Jeans for my son. while they have some great sales, they just don’t fit his body frame very well…so we cannot take advantage of the sales. @Jenny – I agree with you on the using of less detergent. BUT, for a cost comparison, I think the standard “price per load” still holds true. If you decrease each laundry soap brand by 1/2, then the price comparison still holds true. I had this thought after visiting Costco this past saturday, seeing a bottle of gain, in almost every cart, so I head back to see what the BIG DEAL was, 225oz with $4 off. BUT that 225 oz only does 146 loads. That is the new strategy Proctor and Gamble uses, give em more, but do less loads, they simply add water to the product, and then tell you to use more of it for each load. @lanie Browar – Thanks for the tip – worth checking out!